In the top location . This amazing modern villa located in the “Beverly Hills" area of Aruba, only 46 seconds drive or walk to the beautiful beach or golf! Just a 3 minute drive to Arashi beach, the islands most gorgeous beach! This very high end newly renovated vacation villa is modern and relaxing. Located just minutes to wind surfing, sky diving, snorkel, scuba diving, fine dining, casinos, night life and endless miles of gorgeous scenery and beaches. When you first arrive to the villa you will find it with a sliding privacy gate, higher walls and a modern feel. As you enter the home you will see 5 kings sized beds in 4 separate bedrooms each with bath, air conditioning, ceiling fans, UHD TV and fast WiFi throughout. The home features a wall of glass leading to the back 3 patios, one fully covered, a pergola affording partial coverage and a open sun deck. A few steps down to a tropical wood deck and a 14,000 gallon salt water pool lit in cool blue at night. Surrounding the pool area are 8 chaise lounge chairs and light blue cushion pads. Please get your tan on! All bedrooms are en suite with gorgeous modern bath areas. All finished in Italian porcelain. All bedrooms have large 4K UHD TV’s, king-size beds, and a expanded bathrooms featuring walk-in rain showers. Throughout the home is very high speed wireless internet with a single ID including outside the home and around the pool area. Additionally there is internal living room speakers with a wireless Bluetooth amplifier for your music pleasure. Pricing starting at $299.00 per night for the first 2 people and then $50.00 extra per night for each additional guest. Variable pricing allows for smaller groups to experience one of the top Aruba properties. Walk to ocean or golf! We wanted something modern but very island gorgeous. We we struck the balance! Our very eco island friendly home is the best escape your vacation accommodations. Large spacious, very safe and private. No crowds to hear or compete with. No safety issues with people all around and best of all a walk to the water! Walk to ocean or golf! Private and secure. Upgrade from the crowded resorts. Life is All Inclusive at the Aruba Haven. You own pool, yard, kitchen, washing machine, dryer etc... thats real ALL inclusive! we have a relationship with a personal fitness coach for at villa programs and/or on the beach! Massive rare wooden deck area with 8 chaise lounge chaises. Gorgeous, private 14,000 gallon salt water pool lit with colored LED's in the evening. We absolutely loved staying here and Leigh and Judy were amazingly accommodating as well as informative. They sent us a 9-page PDF of useful information so we could plan our stay: places to go, things to do, best restaurants, etc. All recommendations were spot on. They were also helpful and accessible during our trip, answering every question quickly and thoroughly. By the way, there are hard copies of the PDF on site so you can reference it throughout your stay. The pool deck was our favorite part of this modern, spacious, wonderful home. We started and ended every day there. There are plenty of lounge chairs, a table if you care to eat outside, a big, comfortable couch and a gas grill that we used to cook a wonderful dinner of fresh fish and scallops. The hammock was a favorite spot for the kids. They stock a bunch of towels for pool or beach time. Back to the house: the bedrooms are spacious, there's an air conditioner in every room, and the beds are comfortable. The kitchen was well stocked with everything we needed... including some staples like salt, pepper, spices, etc. The mantra is to use what you need, and leave supplies behind for the next person. It was great to have a washer and dryer on site so we throw a load in every once in a while. We also took advantage of the cable to watch several NCAA basketball games during March Madness. I can't say enough great things about this place. We loved it. It was wonderful, cool and comfortable and a true haven to return to after a day at the beach, or on the ATV tour, or the catamaran.... thanks Leigh and Judy. We hope to be back as soon as possible! Property was spotless and very well manicured inside and out. The pool and patio area are great for gathering and relaxing away from the beach and sun. Bedrooms/bathrooms were immaculate and very comfortable. All the amenities you would expect from a property of this magnitude. Great location in a very safe area. Close by groceries, shopping and restaurants, easy to get around the island and 15 minutes from the airport. If you rent UTV's, they will be delivered and picked up right in front of the house. Very convenient and less than a mile to Arashi beach. Avoid the overpriced and overcrowded resorts and relax! A true home away from home. Thanks for staying and caring for the Aruba Haven! Hope to see you at the Mountain Haven very soon. Second time to the villa. Judy, Leigh and Lars are all very professional. Renting a home is a completely and much better vacation experience. We absolutely LOVE the large open space and privacy. Personal chef is top notch. ATV from the home was great and most days we just walked a couple minutes to the beach. We did explore a few other beaches around the country. Arashi is maybe a 3 minute drive. Can not wait to go back. Thank you for opening your home to us! So glad y'all enjoyed the home and the area as much as we do! Please come back often! Leigh,Judy, and Lars were fantastic hosts. They were helpful with anything and everything including restaurant ideas, activities etc. There is a great guest book as well. The house is very well equipped with all the amenities you need. The outdoor space was great to enjoy your morning coffee or lounge by the pool (a little chilly in the morning and evening). We had an issue when we first arrived and had no hot water for 3 days. They worked to get it back as quickly as they could. Grocery delivery was the best, we had food and drinks after a long day of traveling. The property is located in a safe neighborhood and very close to a wonderful beach! Loved having the beach chairs. Would stay again! Thanks for your hospitality! Thanks for choosing the Aruba Haven. Hope to have you back again soon and thanks for your patience with the warm water. We just returned from a very relaxing and fun trip to Aruba. We (4 adult couples) stayed at Aruba Haven and enjoyed every minute. The house has 4 bedrooms and each has a king size bed and private bath. (Very hard to find!) The indoor common areas are spacious and the kitchen is well equipped. There is also an outside gas grill. The outside living area is amazing and is where we spent countless hours laughing, relaxing, reading and sunning. The outside seating area is big enough for a group and the pool area is surrounded with comfortable pool chairs. The pool was big enough for all of us to relax in. Leigh and Judy provided a guide for us and it was invaluable, since none of us had ever been to Aruba before. Lars, the on site manager, was also helpful and was quick to respond to any questions or needs. While this house is not on the beach, the beach is a short walk away. Our group rented a van and explored the island. The grocery store is close by and we grilled in some nights, ate out others and had the private in home chef come in- this was a fabulous experience and we wished we had done it more often. There was so much food left over, we feasted on it the following night. Beach towels, coolers and beach chairs are provided, the house has WiFi and cable and there is a flat screen TV in each bedroom in addition to the indoor living area. There is a safe in the house, which we used to lock up our passports, but we all felt safe in this residential neighborhood. The house is away from the high rise hotel zone but close to beautiful beaches and restaurants. We especially enjoyed Barefoot and Papimento and the California Lighthouse for sunset (not a meal). We would highly recommend reservations for dinner. 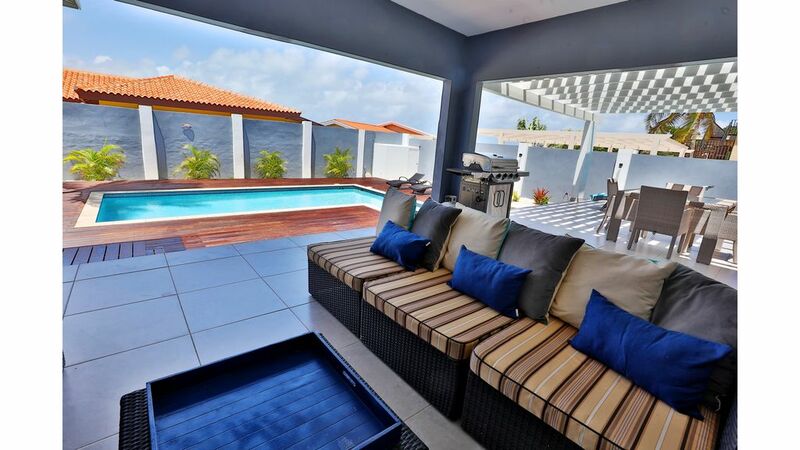 Don't miss Aruba's sunsets and and a chance to enjoy this wonderful house. The pictures on the web site are very accurate and the owners have paid attention to every detail needed to make your stay wonderful. EVERYONE IN OUR GROUP HAD A WONDERFUL STAY! Thanks Judy, Leigh and Lars!! Thank you for staying and caring for the Aruba Haven. You week next year is waiting and hope you come back! Aruba Haven is truly a sanctuary that soothes the active mind and calms the lifestyle of the busy soul . The home facilitates the transition with a relaxing atmosphere of design and comfort and provides everything that one may need to feel right at home . The beaches from Arashi to Boca Catalina were our favorites. The people we met were as colorful and diverse as the fish in the sea. Best regards to you and your families. Safe travels back. Thank you so much for staying at our home and we welcome you back anytime! See the How To Guide for details.